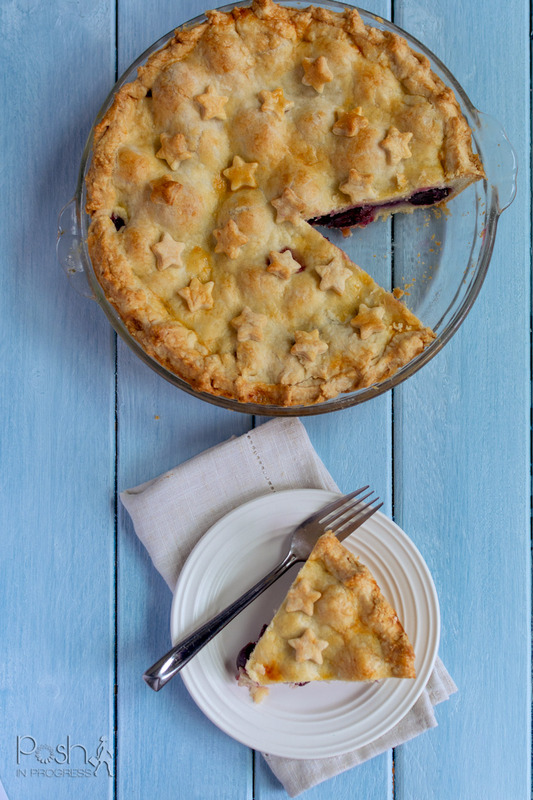 I’ve made pie crust before, but I’ve never made a fresh fruit pie. I’ve made turnovers and galettes, but never a homemade pie from scratch. After a very stressful week at work, I came home and decided to bake. Given that there weren’t many groceries in the house, I didn’t have a lot of options. I opted to make a cherry pie with fresh cherries because I had all the ingredients I needed. Plus, I really love to use summer produce when it’s at it’s peak. 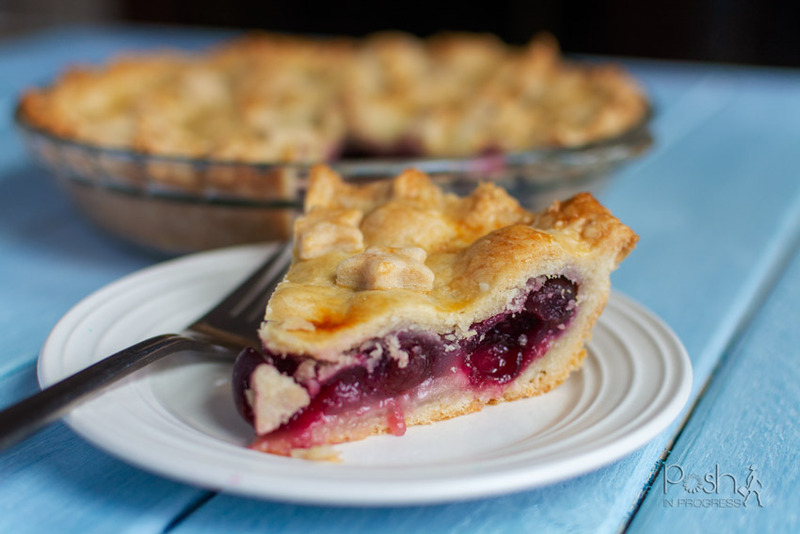 The pie crust recipe I use is actually quiet easy to make, so I wasn’t too worried about that. I was actually a bit more concerned about how the filling would turn out and whether the pie would look pretty when it was done. With fruit pies, you never know if they are going to leak out everywhere and look like a mess. I was super relieved that all the juices stayed inside. To ensure it would look pretty, I added little stars on top. The stars actually held their shape, which I was happy to see. Plus, they just make the pie look so much cuter. 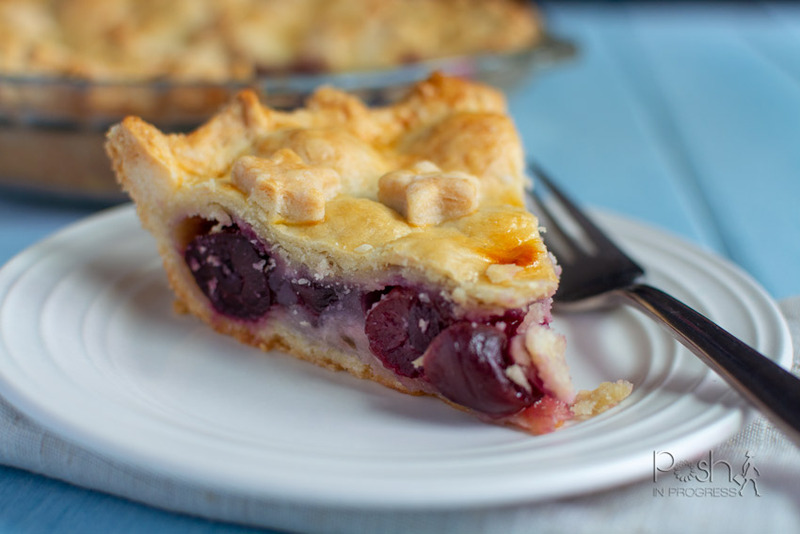 This cherry pie with fresh cherries really is the perfect pie for summer. I’m definitely going to make this recipe again for labor day. Make the crust: Add the flour, salt, and sugar together in the food processor and pulse a few times. Add the butter pieces and pulse until the butter pieces are the size of peas; be careful not to over-blend. Combine the water, cider vinegar, and ice in a large measuring cup or small bowl. Add 2 tablespoons of the ice water mixture into the flour mixture, and pulse until it is fully incorporated. Add more of the ice water mixture, 1 to 2 tablespoons at a time and pulse to mix until the dough comes together with some dry bits remaining. 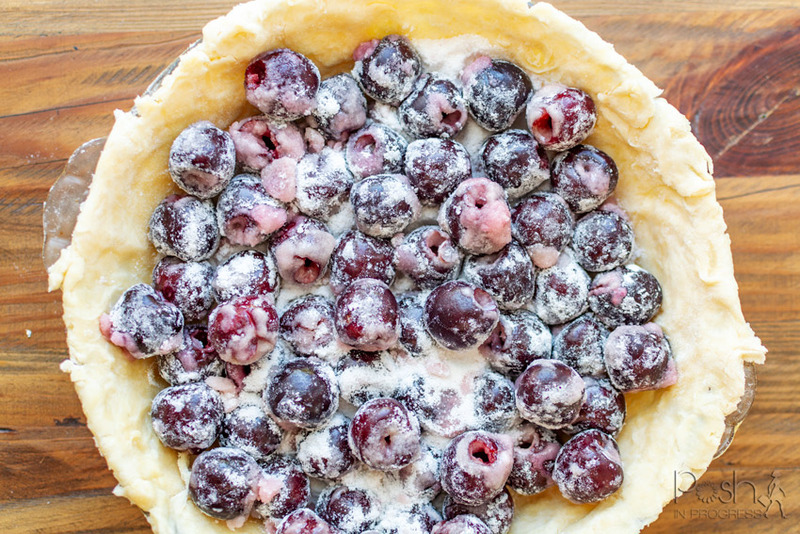 As the dough chills, make the filling: You will need to pit the cherries, rinse them, and then dry them. I placed mine in a bowl over two pieces of paper towel to soak up as much water as possible. 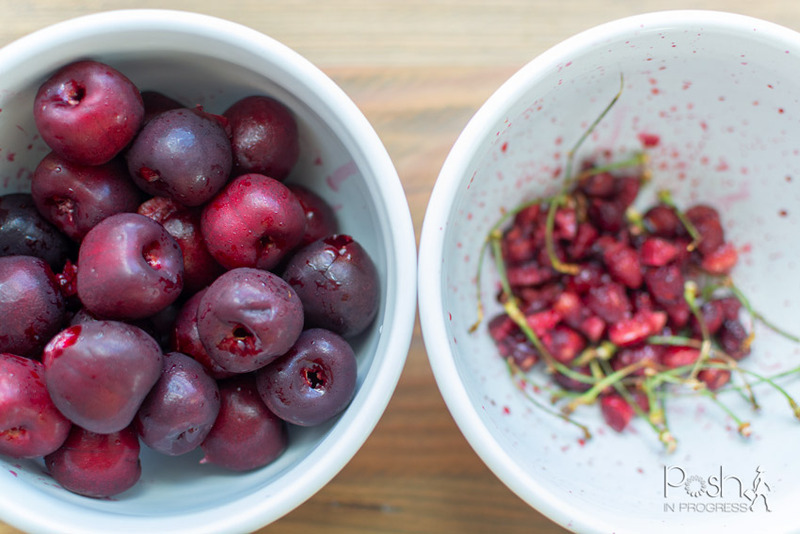 Stir together the cherries, cornstarch, sugar, and salt, gently together in a large bowl and set aside. Once it is chilled, roll out the dough. Roll out half of chilled dough on a floured work surface to 13-inch round. Gently place it in 9-inch pie pan, either by rolling it around the rolling pin and unrolling it over the pan or by folding it into quarters and unfolding it in the pan. Trim edges to a half-inch overhang. Spoon filling into pie crust, discarding any liquid that has pooled in the bowl. I had a lot of loose sugar and corn starch when I mixed it all together, but I just added that to the pie anyway. I wanted to ensure the filling wasn’t super goopy, so I think all that extra sugar and corn starch really soaked up the liquid and gave me a pretty solid filling. Roll out the remaining dough into a 12-inch round on a lightly floured surface, drape it over the filling, and trim it, leaving a 1-inch overhang. Fold the overhang under the bottom crust, pressing the edge to seal it, and crimp the edge decoratively. Brush the egg wash over over pie crust. I used some of the excess dough to make little stars to put on top as decoration. I used these cookie cutters to make the stars, and I think they turned out so well! Cut slits in the crust with a sharp knife (I actually placed stars on top of my vents, but didn’t push firmly, so those cuts in the dough wouldn’t show), forming steam vents. Bake the pie in the middle of the oven for 25 minutes. Reduce the temperature to 350°F. and bake the pie for 25 to 30 minutes more, or until the crust is golden. Let the pie cool on a rack. I let mine cool overnight because I wanted it to be nice and firm and room temperature before I cut it. I’m so glad I waited because I love that the pieces cut so cleanly!